This recipe uses a number of my favorite techniques: mashing, slathering, and drizzling. Imagine a Shepherd's pie meeting the flavors of an Indian samosa. That's where we're headed. 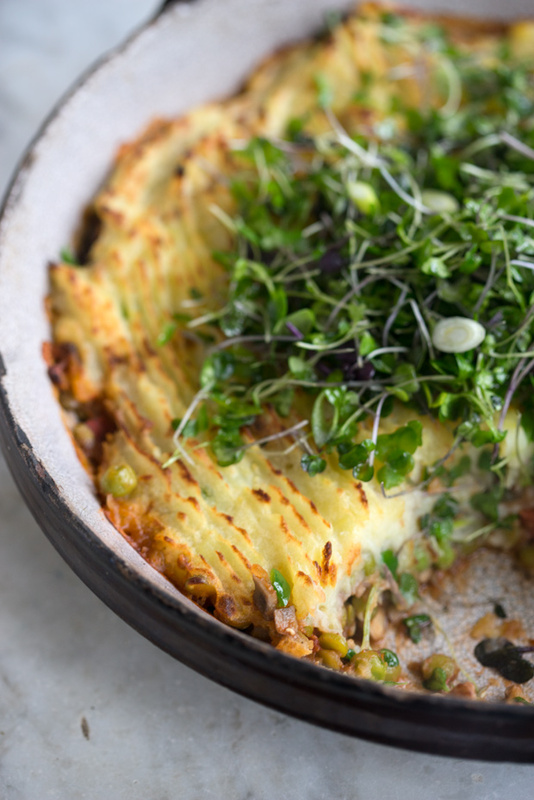 Shepherd's pies are typically lamb or meat based, but this is a veg-friendly version. Here's how this shepherd's pie comes together. It's pretty straight-forward. You make a hearty, flavor-packed, vegan base using split peas (or lentils), chopped mushrooms, spices, and crushed tomatoes. Layer this under a thick slather of mashed potatoes and baked until the top is golden and a bit crusted. If I know the week ahead is going to be a crusher, I'll assemble everything over the weekend, and all I have to do is pop it in the oven a bit later in the week. Give it a go, this has been on repeat all winter. I forget to mention this in the video, but you can certainly create smaller, individual pies - they're cute, and people love getting their own. And you can absolutely swap in sweet potatoes, just give them a quick peel first. Cold-weather comfort food, without a lot of the trappings. You can make the "crust" with sweet potatoes, potatoes, or a blend of the two. You can prepare ahead of time, and bake just before serving. If you use sweet potatoes, peel them. Place the potatoes/sweet potatoes in a medium saucepan, cover with water, salt as you would pasta water, and bring to a boil for about ten minutes, or until tender. Drain, and return to saucepan over heat for a minute or so to dry out a bit. Add the coconut milk, and the salt, and mash together. Set aside. In a large saucepan over medium-high heat, combine the coconut oil with the onion and garlic, and a generous pinch of salt. Sauté for a few minutes, until onions are translucent, and then turn the heat up and add the mushrooms. Cook, stirring every couple of minutes, until the mushrooms release their water, and start to brown. Add the tomatoes and spices. Stir well, then add the cooked split peas and peas. Cook for another minute or two, taste, and adjust with more garam masala or salt if needed.